Full details of the bid documents can be found on travelwest.info/cycleambitiongrant website. We have extracted what is specific to Bath from this. CCAG bids are about doing things that just could not be achieved within budgets for the Local Sustainable Transport funds (at most 150k for a project). You would never get a spend of £1m on a bridge. This is what the CCAG is all about. Ambition. This is laid out into 4 sections. To be Elaborated:- Yup, we know it’s coming. Think hard about it and be ready to get involved when we can. Ready for Delivery:- Cycle Bath has done all it can, the plans are set in stone and we are just watching it happen. Delivered:- Either being built or nothing else left to do. Any issues probably to be raised post delivery. £675k spend. Delivery in 2015-2016 year. The trello board with all of the scheme breakdown. SVG Map of above available here. 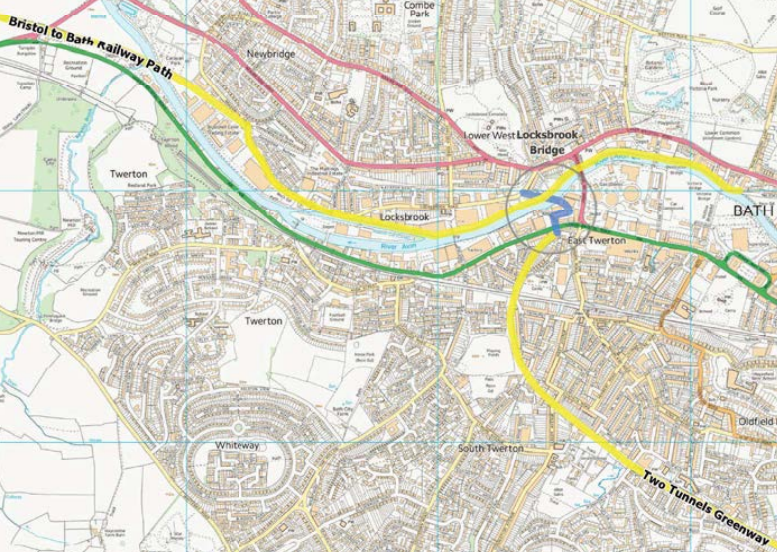 Widen bridge to improve access to city centre and Rail station for pedestrians and cyclists from south Bath. £1800k spend between 2016-2018; £900k in 16/17; £900k in 17/18. 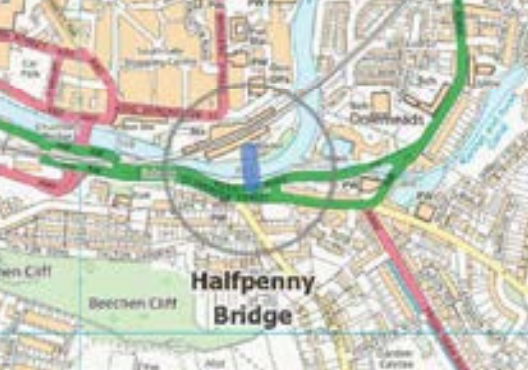 Halfpenny Bridge includes the link to Rossiter Road as well as the bridge and the opening up of the arches in the rail bridge to get through. We don’t cause pedestrians much hassle, but a lot of other cyclists do and putting in this bridge sorts out that issue as well as linking things up. £1300k spend between 2016-2018; £300k in 16/17; £1000k in 17/18. 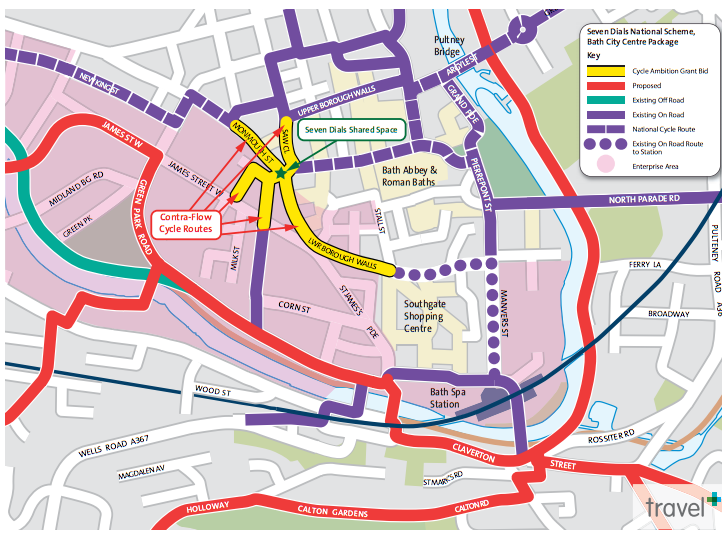 Cycle parking to support door-to-door journeys and Riverside development. £88k spend between 2015-2017; £40k in 15/16; £48k in 16/17. 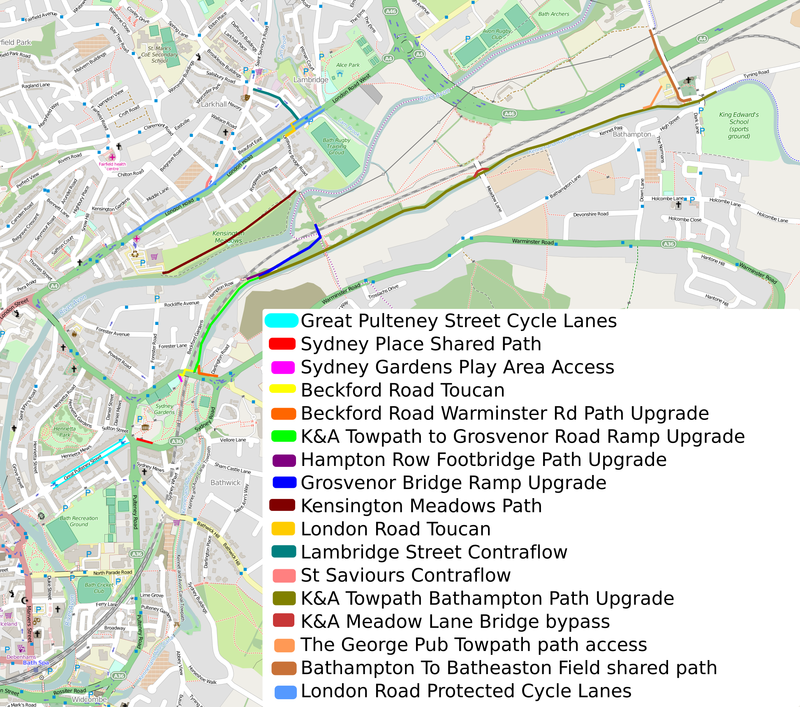 The project aims to improve the area as a public space with more focus on the needs of people walking and cycling.